Mr. Charles, a Civil Engineer by training, was born and raised in Saint-Marc, Haiti. He moved to New Jersey from Haiti in January 2000. He graduated with Bachelor of Science in Civil Engineering in 2007 from the New Jersey Institute of Technology and an Associate of Science in Engineering from Essex County College. He is currently working for T.Y. Lin International, a Civil and Structural Engineering Firm in the New Jersey/New York area. 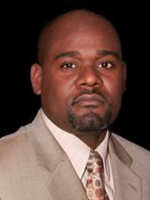 Mr. Charles is a founding member of the National Alliance for the Advancement of Haitian Professionals.